I don’t think I need to explain to y’all how much I love lasagna. It’s been the topic of conversation on several posts about lasagna. Even this past birthday Mom said, “You should make yourself some lasagna for your birthday dinner.” There’s a reason they called me Garfield growing up. But this isn’t a typical lasagna. This is a taco lasagna. Filled with delicious taco meat, tomatoes, cheese, and tortillas. Because, in my head at least, a casserole is always comfort food. Always. No questions asked. And for me comfort food is delicious tacos and lasagna and egg rolls. No, there’s no egg rolls in this recipe. I’m just saying that my idea of comfort foods isn’t exactly everyone else’s ideas. Of course, the first thing I thought when we said casseroles was a pasta casserole of some kind. But, to keep from being a one trick pony on casseroles I wanted to change things up and make something different. I wanted to make something that I’ve been dying to make for a while, but didn’t quite get the recipe right. I’ve had a few failures in the past on a Tex-Mex style lasagna. Too hot. Too tangy. Corn tortilla failure. Salsa failure. Take your pic. I’ve failed at it. I even made one that was almost inedible. We both suffered through one serving and the rest went down the drain. Which I hate. Food waste is sacrilege in my book. But if it’s inedible, there’s no helping it. Sometimes, you just have to Elsa it. You know. So, with all this crazy cold weather we’ve been having, a comforting casserole really did hit the spot. And, well, it warmed us up even more than I anticipated! I originally wrote the recipe with 1/4 teaspoon cayenne pepper. Don’t do that unless you like it to be spicy. At least for me it was a bit more spicy than I thought. But, this is your casserole now. Make it however spicy you want to make it! Don’t get me wrong! I love me some Taco Bell, too. So, I was trying to make some delicious taco meat that he would truly enjoy at home. And, maybe we can have tacos more often than we usually do. Because, well, my idea of a good taco isn’t Taco Bell. Yet, after tasting this meat, it could be. The spice mix and sauce that’s made with this taco meat is delicious. Lick the pan delicious! He even commented on how good the meat tasted. Which is surprising. He doesn’t usually say that when I make something Tex-Mex for tacos, enchiladas, etc. Our palates are just a little different in that cuisine style. I want carne, I want al pastor, and I want pollo guisado on my tacos. He wants ground beef. Maybe some steak, but usually ground beef or plain chicken. And there’s nothing wrong with that. We were just raised a little different with our Tex-Mex cooking. I mean, we were making skirt steak fajitas before they were popular. I’m not kidding. Flank steak used to be cheap. Dirt cheap. I had more than my fair share of fajitas and tacos, and you name it made with flank steak. Now’s it’s expensive. But, now, I know of a similar cut that has a different name as is just as cheap as flank steak used to be. No, I’m not sharing! I don’t want this cut to get all expensive, too. Okay, just look at those delicious layers! Yes, there’s beef right there in your face! It’s mingling with some tomatoes but not so much that it interferes with the creamy good taco beef. And you can see it’s sandwiched between two layers of flour tortillas and cheese. Okay. I’m getting hungry again. I resisted the urge to eat the whole piece before I photographed it for this post. But, I did devour it when I finished shooting it. The beef, the cheese, the layers, the tortillas. It is so delicious. Your family is going to love it. And, it really did come together super quick. Which is perfect for any night of the week. 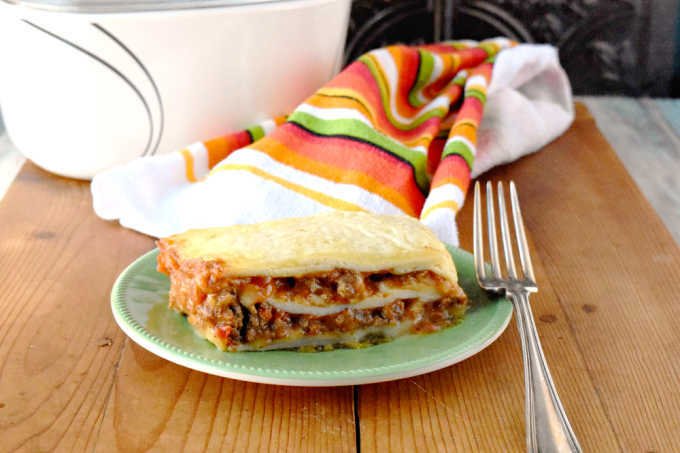 Make sure you double or triple the spice mix so you can have it on hand any time your family wants this taco lasagna for dinner. And they’re going to ask for it often because it’s so tasty. Or you can save it for any time your family wants delicious tacos for dinner. I have a jar full in my pantry so I can make the hubs tacos any time he wants them. Combine the first 10 ingredients (cornstarch through cayenne) in a small bowl. Set aside. Heat a large skillet over medium-high heat. Add the ground beef and sauté until browned and cooked through. Stir in the seasoning mix and cook an additional 2 minutes. Reduce the heat to simmer and stir in the beef broth. Simmer the beef mixture until thickened. Place the beef in a large mixing bowl and stir in the canned tomatoes and cheese soup. Add 1/2 cup cheddar cheese. Place the salsa in the bottom of a casserole dish sprayed with cooking spray. Lay 5 taco shells on top of the salsa. Top with half of the beef mixture and half of the remaining cheddar cheese. Layer another 5 taco shells, the remaining beef, and the remaining cheddar cheese. Top with the remaining taco shells. Cover and bake at 350 for 45 minutes. Uncover, sprinkle the mozzarella cheese on top. Bake an additional 15 minutes or until the cheese is melted and bubbly. Cool 10 minutes before slicing and serving. Right? It’s a great mash up recipe. I love Mexican casseroles and anything taco is at the top of my list! My hubs is the same way. He LOVES tacos. Using the cheese soup in this is such a great idea! I bet that adds a great flavor and creaminess! It really does! I’ve been using it make enchiladas for years. Which reminds me, I’m past due for sharing that recipe. A nice switch from noodles. I’m also with you on wasting food. I didn’t even think of using noodles. I might have to try that one next. I hope you enjoy it! It’s might tasty. Oh, it’s a day to day struggle to pick one for me. It’s just so hard to chose. They’re both delicious. Thsi sounds delicious and I love that it’s made like a lasagna! Thank you! And it’s so easy to whip up, too. This looks fabulous. I do remember the days when flank steak was kind of a secret. It’s my all time favorite. Thank you! People look at me like I’m crazy when I say that. They just don’t know….